This article is about a class of books included in some Bibles. For other books generally excluded from Bibles, see Apocrypha. This article is about biblical books printed apart from the New and Old Testaments. For books whose inclusion in the Old Testament canon is controversial, see Deuterocanonical books. The Biblical apocrypha (from the Greek ἀπόκρυφος, apókruphos, meaning "hidden") denotes the collection of ancient books found, in some editions of the Bible, in a separate section between the Old and New Testaments or as an appendix after the New Testament. Although the term apocrypha had been in use since the 5th century, it was in Luther's Bible of 1534 that the Apocrypha was first published as a separate intertestamental section. To this date, the Apocrypha is "included in the lectionaries of Anglican and Lutheran Churches." Moreover, the Revised Common Lectionary, in use by most mainline Protestants including Methodists and Moravians, lists readings from the Apocrypha in the liturgical kalendar, although alternate Old Testament scripture lessons are provided. The preface to the Apocrypha in the Geneva Bible explained that while these books "were not received by a common consent to be read and expounded publicly in the Church," and did not serve "to prove any point of Christian religion save in so much as they had the consent of the other scriptures called canonical to confirm the same," nonetheless, "as books proceeding from godly men they were received to be read for the advancement and furtherance of the knowledge of history and for the instruction of godly manners." Later, during the English Civil War, the Westminster Confession of 1647 excluded the Apocrypha from the canon and made no recommendation of the Apocrypha above "other human writings", and this attitude towards the Apocrypha is represented by the decision of the British and Foreign Bible Society in the early 19th century not to print it (see below). Today, "English Bibles with the Apocrypha are becoming more popular again" and they are often printed as intertestamental books. Most of the books of the Protestant Apocrypha are called deuterocanonical by Catholics per the Council of Trent and all of them are called anagignoskomena by the Eastern Orthodox per the Synod of Jerusalem. The Anglican Communion accepts "the Apocrypha for instruction in life and manners, but not for the establishment of doctrine (Article VI in the Thirty-Nine Articles)", and many "lectionary readings in The Book of Common Prayer are taken from the Apocrypha", with these lessons being "read in the same ways as those from the Old Testament". The Protestant Apocrypha contains three books (3 Esdras, 4 Esdras and the Prayer of Manasseh) that are accepted by many Eastern Orthodox Churches and Oriental Orthodox Churches as canonical, but are regarded as non-canonical by the Catholic Church and are therefore not included in modern Catholic Bibles. Jerome completed his version of the Bible, the Latin Vulgate, in 405. In the Middle Ages the Vulgate became the de facto standard version of the Bible in the West. The Vulgate manuscripts included prologues that Jerome clearly identified certain books of the Vulgate Old Testament as apocryphal or non-canonical. Also included is the book of the model of virtue (παναρετος) Jesus son of Sirach, and another falsely ascribed work (ψευδεπιγραφος) which is titled Wisdom of Solomon. The former of these I have also found in Hebrew, titled not Ecclesiasticus as among the Latins, but Parables, to which were joined Ecclesiastes and Song of Songs, as though it made of equal worth the likeness not only of the number of the books of Solomon, but also the kind of subjects. The second was never among the Hebrews, the very style of which reeks of Greek eloquence. And none of the ancient scribes affirm this one is of Philo Judaeus. Therefore, just as the Church also reads the books of Judith, Tobias, and the Maccabees, but does not receive them among the canonical Scriptures, so also one may read these two scrolls for the strengthening of the people, (but) not for confirming the authority of ecclesiastical dogmas. What sin have I committed in following the judgment of the churches? But when I repeat what the Jews say against the Story of Susanna and the Hymn of the Three Children, and the fables of Bel and the Dragon, which are not contained in the Hebrew Bible, the man who makes this a charge against me proves himself to be a fool and a slanderer; for I explained not what I thought but what they commonly say against us. (Against Rufinus, II:33 [AD 402]). According to Michael Barber, although Jerome was once suspicious of the apocrypha, he later viewed them as Scripture as shown in his epistles. Barber cites Jerome's letter to Eustochium, in which Jerome quotes Sirach 13:2.; elsewhere Jerome also refers to Baruch, the Story of Susannah and Wisdom as scripture. Apocrypha are well attested in surviving manuscripts of the Christian Bible. (See, for example, Codex Vaticanus, Codex Sinaiticus, Codex Alexandrinus, Vulgate, and Peshitta.) After the Lutheran and Catholic canons were defined by Luther (c. 1534) and Trent (8 April 1546) respectively, early Protestant editions of the Bible (notably the Luther Bible in German and 1611 King James Version in English) did not omit these books, but placed them in a separate Apocrypha section apart from the Old and New Testaments to indicate their status. This famous edition of the Vulgate was published in 1455. Like the manuscripts it was based on, the Gutenberg Bible lacked a specific Apocrypha section; its Old Testament included the books that Jerome considered apocryphal, and those Clement VIII later moved to the appendix. The Prayer of Manasses was located after the Books of Chronicles, and 3 and 4 Esdras followed 2 Esdras (Nehemiah), and Prayer of Solomon followed Ecclesiasticus. Martin Luther translated the Bible into German during the early part of the 16th century, first releasing a complete Bible in 1534. His Bible was the first major edition to have a separate section called Apocrypha. Books and portions of books not found in the Masoretic Text of Judaism were moved out of the body of the Old Testament to this section. Luther placed these books between the Old and New Testaments. For this reason, these works are sometimes known as inter-testamental books. The books 1 and 2 Esdras were omitted entirely. Luther was making a polemical point about the canonicity of these books. As an authority for this division, he cited St. Jerome, who in the early 5th century distinguished the Hebrew and Greek Old Testaments, stating that books not found in the Hebrew were not received as canonical. Although his statement was controversial in his day, Jerome was later titled a Doctor of the Church and his authority was also cited in the Anglican statement in 1571 of the Thirty-Nine Articles. Luther also expressed some doubts about the canonicity of four New Testament books, although he never called them apocrypha: the Epistle to the Hebrews, the Epistles of James and Jude, and the Revelation to John. He did not put them in a separate named section, but he did move them to the end of his New Testament. In 1592, Pope Clement VIII published his revised edition of the Vulgate, referred to as the Sixto-Clementine Vulgate. He moved three books not found in the canon of the Council of Trent from the Old Testament into an appendix "lest they utterly perish" (ne prorsus interirent). The protocanonical and deuterocanonical books he placed in their traditional positions in the Old Testament. The British Puritan revolution of the 1600s brought a change in the way many British publishers handled the apocryphal material associated with the Bible. The Puritans used the standard of Sola Scriptura (Scripture Alone) to determine which books would be included in the canon. The Westminster Confession of Faith, composed during the British Civil Wars (1642–1651), excluded the Apocrypha from the canon. The Confession provided the rationale for the exclusion: 'The books commonly called Apocrypha, not being of divine inspiration, are no part of the canon of the Scripture, and therefore are of no authority in the church of God, nor to be any otherwise approved, or made use of, than other human writings' (1.3). Thus, Bibles printed by English Protestants who separated from the Church of England began to exclude these books. All English translations of the Bible printed in the sixteenth century included a section or appendix for Apocryphal books. Matthew's Bible, published in 1537, contains all the Apocrypha of the later King James Version in an inter-testamental section. The 1538 Myles Coverdale Bible contained an Apocrypha that excluded Baruch and the Prayer of Manasseh. The 1560 Geneva Bible placed the Prayer of Manasseh after 2 Chronicles; the rest of the Apocrypha were placed in an inter-testamental section. The Douay-Rheims Bible (1582–1609) placed the Prayer of Manasseh and 3 and 4 Esdras into an Appendix of the second volume of the Old Testament. In the Zürich Bible (1529–30) they are placed in an Appendix. They include 3 Maccabees, along with 1 Esdras & 2 Esdras. The 1st edition omitted the Prayer of Manasseh and the Rest of Esther, although these were included in the 2nd edition. The French Bible (1535) of Pierre Robert Olivétan placed them between the Testaments, with the subtitle, "The volume of the apocryphal books contained in the Vulgate translation, which we have not found in the Hebrew or Chaldee". In 1569 the Spanish Reina Bible, following the example of the pre-Clementine Latin Vulgate, contained the deuterocanonical books in its Old Testament. Following the other Protestant translations of its day, Valera's 1602 revision of the Reina Bible moved these books into an inter-testamental section. All King James Bibles published before 1666 included the Apocrypha, though separately to denote them as not equal to Scripture proper, as noted by Jerome in the Vulgate, to which he gave the name, "The Apocrypha." In 1826, the National Bible Society of Scotland petitioned the British and Foreign Bible Society not to print the Apocrypha, resulting in a decision that no BFBS funds were to pay for printing any Apocryphal books anywhere. Since that time most modern editions of the Bible and reprintings of the King James Bible omit the Apocrypha section. In the 18th century, the Apocrypha section was omitted from the Challoner revision of the Douay-Rheims version. In the 1979 revision of the Vulgate, the section was dropped. Modern reprintings of the Clementine Vulgate commonly omit the Apocrypha section. Many reprintings of older versions of the Bible now omit the apocrypha and many newer translations and revisions have never included them at all. The American Bible Society lifted restrictions on the publication of Bibles with the Apocrypha in 1964. The British and Foreign Bible Society followed in 1966. The Stuttgart edition of the Vulgate (the printed edition, not most of the on-line editions), which is published by the UBS, contains the Clementine Apocrypha as well as the Epistle to the Laodiceans and Psalm 151. 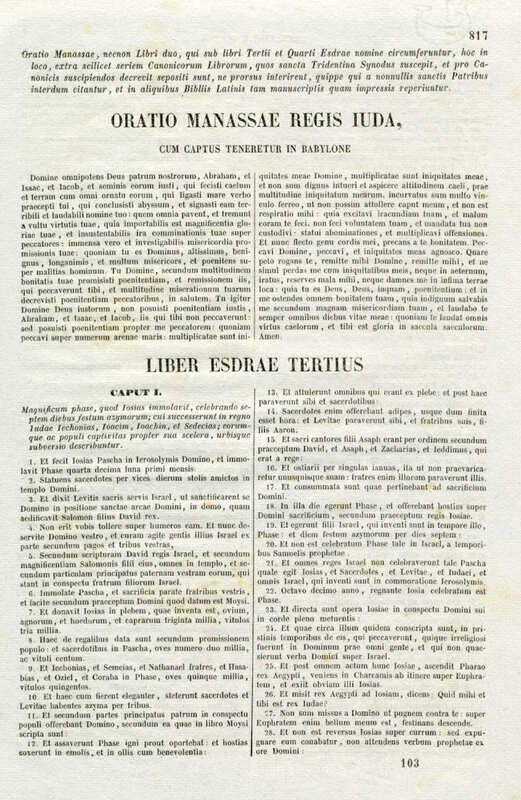 Brenton's edition of the Septuagint includes all of the Apocrypha found in the King James Bible with the exception of 2 Esdras, which was not in the Septuagint and is no longer extant in Greek. He places them in a separate section at the end of his Old Testament, following English tradition. In Greek circles, however, these books are not traditionally called Apocrypha, but Anagignoskomena (ἀναγιγνωσκόμενα), and are integrated into the Old Testament. The Orthodox Study Bible, published by Thomas Nelson Publishers, includes the Anagignoskomena in its Old Testament, with the exception of 4 Maccabees. This was translated by the Saint Athanasius Academy of Orthodox Theology, from the Rahlfs Edition of the Septuagint using Brenton's English translation and the RSV Expanded Apocrypha as boilerplate. As such, they are included in the Old Testament with no distinction between these books and the rest of the Old Testament. This follows the tradition of the Eastern Orthodox Church where the Septuagint is the received version of Old Testament scripture, considered itself inspired in agreement with some of the Fathers, such as St Augustine, rather than the Hebrew Masoretic text followed by all other modern translations. The Septuagint, the ancient and best known Greek version of the Old Testament, contains books and additions that are not present in the Hebrew Bible. These texts are not traditionally segregated into a separate section, nor are they usually called apocrypha. Rather, they are referred to as the Anagignoskomena (ἀναγιγνωσκόμενα, "things that are read" or "profitable reading"). The anagignoskomena are Tobit, Judith, Wisdom of Solomon, Wisdom of Jesus ben Sira (Sirach), Baruch, Letter of Jeremiah (in the Vulgate this is chapter 6 of Baruch), additions to Daniel (The Prayer of Azarias, Susanna and Bel and the Dragon), additions to Esther, 1 Maccabees, 2 Maccabees, 3 Maccabees, 1 Esdras, i.e. all of the Deuterocanonical books plus 3 Maccabees and 1 Esdras. Some editions add additional books, such as Psalm 151 or the Odes (including the Prayer of Manasses). 2 Esdras is added as an appendix in the Slavonic Bibles and 4 Maccabees as an appendix in Greek editions. Often included among the pseudepigrapha are 3 and 4 Maccabees because they are not traditionally found in western Bibles, although they are in the Septuagint. Similarly, the Book of Enoch, Book of Jubilees and 4 Baruch are often listed with the pseudepigrapha although they are commonly included in Ethiopian Bibles. The Psalms of Solomon are found in some editions of the Septuagint. The Apocrypha of the King James Bible constitutes the books of the Vulgate that are present neither in the Hebrew Old Testament nor the Greek New Testament. Since these are derived from the Septuagint, from which the old Latin version was translated, it follows that the difference between the KJV and the Roman Catholic Old Testaments is traceable to the difference between the Palestinian and the Alexandrian canons of the Old Testament. This is only true with certain reservations, as the Latin Vulgate was revised by Jerome according to the Hebrew, and, where Hebrew originals were not found, according to the Septuagint. Furthermore, the Vulgate omits 3 and 4 Maccabees, which generally appear in the Septuagint, while the Septuagint and Luther's Bible omit 2 Esdras, which is found in the Apocrypha of the Vulgate and the King James Bible. Luther's Bible, moreover, also omits 1 Esdras. It should further be observed that the Clementine Vulgate places the Prayer of Manasses and 3 Esdras and 4 Esdras in an appendix after the New Testament as apocryphal. A distinction can be made between the Palestinian and the Hellenistic literature of the Old Testament, though even this is open to serious objections. The former literature was written in Hebrew or Aramaic, and seldom in Greek; the latter in Greek. Next, within these literatures there are three or four classes of subject material. 1 Esdras (i.e. Greek Ezra). Christopher Columbus was said to have been inspired by "Six parts hast Thou dried up." from 4 Esdras 6:42 to undertake his hazardous journey across the Atlantic. The introitus, "Eternal rest grant unto them, O Lord, and let perpetual light shine upon them", of the traditional Requiem in the Catholic Church is loosely based on 4 Esdras 2:34–35. The alternative introitus for Quasimodo Sunday in the Roman rite of the Catholic Church is loosely based on 4 Esdras 2:36–37. The Story of Susanna is perhaps the earliest example of a courtroom drama, and perhaps the first example of an effective forensic cross-examination (there are no others in the Bible: except perhaps Solomon's judgement at 1 Kings 3:25). Shylock's reference in The Merchant of Venice to "A Daniel come to judgment; yea, a Daniel!" refers to the story of Susanna and the elders. The theme of the elders surprising Susanna in her bath is a common one in art, such as in paintings by Tintoretto and Artemisia Gentileschi, and in Wallace Stevens' poem Peter Quince at the Clavier. Let Us Now Praise Famous Men, the title of James Agee's 1941 chronicle of Alabama sharecroppers, was taken from Ecclesiasticus 44:1: "Let us now praise famous men, and our fathers that begat us." In his spiritual autobiography Grace Abounding to the Chief of Sinners, John Bunyan recounts how God strengthened him against the temptation to despair of his salvation by inspiring him with the words, "Look at the generations of old and see: did any ever trust in God, and were confounded?" ↑ Bruce, F.F. "The Canon of Scripture". IVP Academic, 2010, Location 1478-86 (Kindle Edition). ↑ Readings from the Apocrypha. Forward Movement Publications. 1981. p. 5. ↑ "The Revised Common Lectionary" (PDF). Consultation on Common Texts. 1992. Archived from the original (PDF) on 1 July 2015. Retrieved 19 August 2015. In all places where a reading from the deuterocanonical books (The Apocrypha) is listed, an alternate reading from the canonical Scriptures has also been provided. ↑ "The books commonly called Apocrypha, not being of divine inspiration, are no part of the Canon of the Scripture; and therefore are of no authority in the Church of God, nor to be any otherwise approved, or made use of, than other human writings." For more details see Development of the Old Testament canon#Church of England. ↑ Ewert, David (11 May 2010). A General Introduction to the Bible: From Ancient Tablets to Modern Translations. Zondervan. p. 104. ISBN 9780310872436. English Bibles were patterned after those of the Continental Reformers by having the Apocrypha set off from the rest of the OT. Coverdale (1535) called them "Apocrypha". All English Bibles prior to 1629 contained the Apocrypha. Matthew's Bible (1537), the Great Bible (1539), the Geneva Bible (1560), the Bishop's Bible (1568), and the King James Bible (1611) contained the Apocrypha. Soon after the publication of the KJV, however, the English Bibles began to drop the Apocrypha and eventually they disappeared entirely. The first English Bible to be printed in America (1782-83) lacked the Apocrypha. In 1826 the British and Foreign Bible Society decided to no longer print them. Today the trend is in the opposite direction, and English Bibles with the Apocrypha are becoming more popular again. ↑ Ewert, David (11 May 2010). A General Introduction to the Bible: From Ancient Tablets to Modern Translations. Zondervan. p. 104. ISBN 9780310872436. ↑ Thomas, Owen C.; Wondra, Ellen K. (1 July 2002). Introduction to Theology, 3rd Edition. Church Publishing, Inc. p. 56. ISBN 9780819218971. ↑ Henze, Matthias; Boccaccini, Gabriele (20 November 2013). Fourth Ezra and Second Baruch: Reconstruction after the Fall. Brill. p. 383. ISBN 9789004258815. Why 3 and 4 Esdraas (called 1 and 2 Esdras in the NRSV Apocrypha) are pushed to the front of the list is not clear, but the motive may have been to distinguish the Anglican Apocrypha from the Roman Catholic canon affirmed at the fourth session of the Council of trent in 1546, which included all of the books in the Anglican Apocrypha list except 3 and 4 Esdras and the Prayer of Manasseh. These three texts were designated at Trent as Apocrypha and later included in an appendix to the Clementine Vulgate, first published in 1592 (and the standard Vulgate text until Vatican II). ↑ "St. Jerome, The Prologue on the Book of Ezra: English translation". ↑ "Jerome, Prologue to the Books of Solomon (2006)". ↑ "Jerome's Prologue to Judith". ↑ Herbermann, Charles, ed. (1913). "Canon of the Old Testament". Catholic Encyclopedia. New York: Robert Appleton Company. section titled "The Council of Florence 1442": "...contains a complete list of the books received by the Church as inspired, but omits, perhaps advisedly, the terms canon and canonical. The Council of Florence therefore taught the inspiration of all the Scriptures, but did not formally pass on their canonicity." ↑ "Gutenberg Bible: View the British Library's Digital Versions Online". ↑ "1945 Edition of the Luther Bible on-line". ↑ Catholic Encyclopaedia, "St. Jerome evidently applied the term to all quasi-scriptural books which in his estimation lay outside the canon of the Bible, and the Protestant Reformers, following Jerome's catalogue of Old Testament Scriptures — one which was at once erroneous and singular among the Fathers of the Church — applied the title Apocrypha to the excess of the Catholic canon of the Old Testament over that of the Jews. Naturally, Catholics refuse to admit such a denomination, and we employ "deuterocanonical" to designate this literature, which non-Catholics conventionally and improperly known as the Apocrypha". ↑ "And the other books (as Hierome saith) the Church doth read for example of life and instruction of manners; but yet doth it not apply them to establish any doctrine." ↑ Article VI at episcopalian.org Archived 28 September 2007 at the Wayback Machine. ↑ "WCF and MESV in Parallel Columns". ↑ Grudem, Wayne (29 February 2012). Understanding Scripture: An Overview of the Bible's Origin, Reliability, and Meaning. USA: Crossway. p. 90. ISBN 978-1433529993. Retrieved 21 June 2014. ↑ Howsam, Leslie (2002). Cheap Bibles. Cambridge University Press. p. 14. ISBN 978-0-521-52212-0. ↑ Flick, Dr. Stephen. "Canonization of the Bible". Christian heritage fellowship. Retrieved 21 June 2014. 1 2 Vassiliadis, Petros (2005). "Canon and authority of Scripture". In S. T. Kimbrough. Orthodox and Wesleyan Scriptural understanding and practice. Crestwood, N.Y: St. Vladimir's Seminary Press. p. 23. ISBN 978-0-88141-301-4. ↑ Gilmore, George William (1916). Selections from the World's Devotional Classics. Funk & Wagnalls company. p. 63. Otto Fridolinus Fritzsche, Libri Apocryphi V. T. Graece (1871). Porter, Frank C. (1898). "Apocrypha". In James Hastings. A Dictionary of the Bible. I. pp. 110–123.